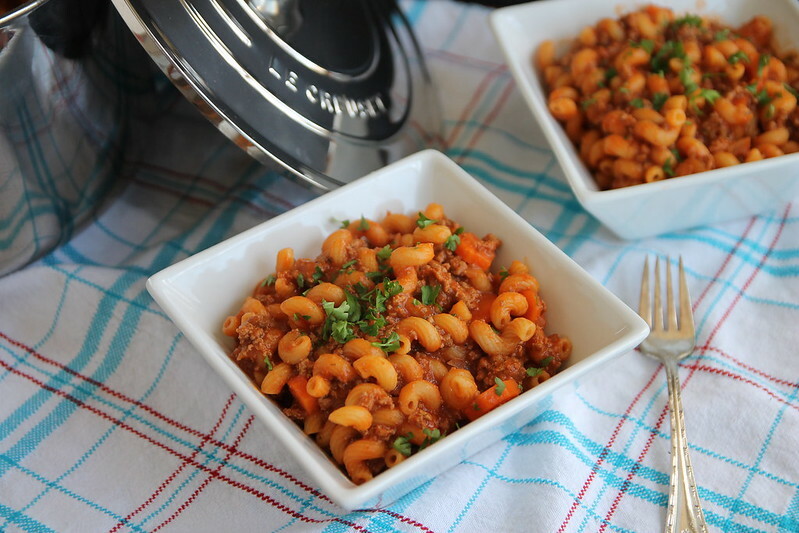 Forget the boxed stuff – all you need is a few ingredients and less than 30 minutes for homemade chili mac! My mother was into making homemade versions of boxed meals long before it was popular. Momma Swope, you’re so ahead of the times. Back when she and my dad were first married, she started making this particular dish, which my dad named “Chili Mac” because it reminded him of something they used to feed him in the army. While my mother was not sure what to make of this at first (he quickly made sure to tell her that her version was infinitely better – my father is not a stupid man), the name stuck. Growing up, we did not have Hamburger Helper, but we did have lots of Chili Mac. Fast forward to today. I am in my own apartment, cooking for Boyfriend on a regular basis, and Chili Mac still makes a regular appearance at dinner. The first time I made it, Boyfriend walked in the door, took one look at the pot simmering on the stove, and excitedly exclaimed, “Hamburger Helper! !” He then proceeded to scrape the pot clean. Truly. In fact, I have taken to doubling the recipe now – while a regular batch *should* comfortably feed a family of four, I am feeding a man who works out for a living. When he loves a dish as much as this, I have no choice but to make enough to feed a small army and pray there is enough left for me to take to work for lunch the next day. 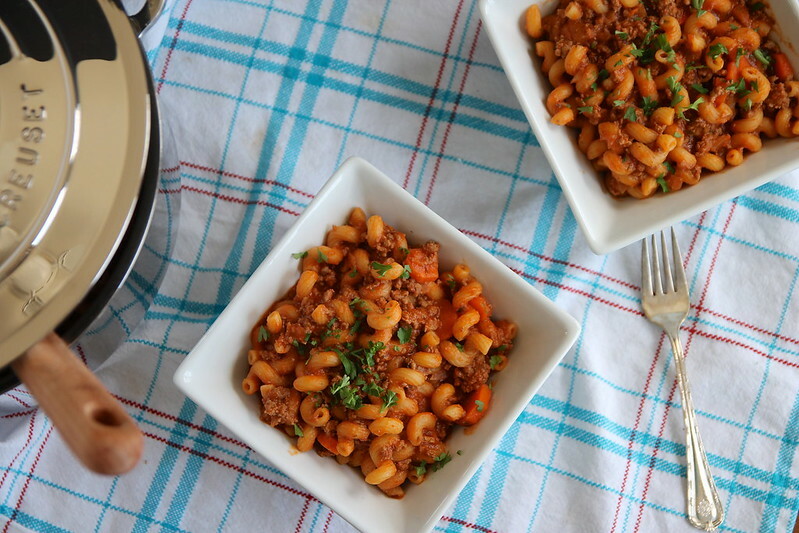 Whatever you choose to call it – Chili Mac or Homemade Hamburger Helper – this is a perfect quick and easy dinner. All you need are a few key ingredients, all of which you probably already have on hand, and less than 30 minutes and you have a filling dinner that everyone will love. The best part? Because you are making it yourself, you can easily control the ingredients. Don’t like beef? Use ground turkey. Use whole wheat or gluten-free pasta instead of regular macaroni. Add extra vegetables – zucchini is particularly nice, especially this time of year. This was one of the first meals I used to break in my new favorite cookware – Le Creuset’s new line of Stainless Steel Cookware. These are some fantastic pots and pans – and, lucky you, Food Fanatic is giving you the chance to win your own 5-piece set of Le Creuset Stainless Steel! Hop on over to enter to win and to get my full two cents on the pieces. 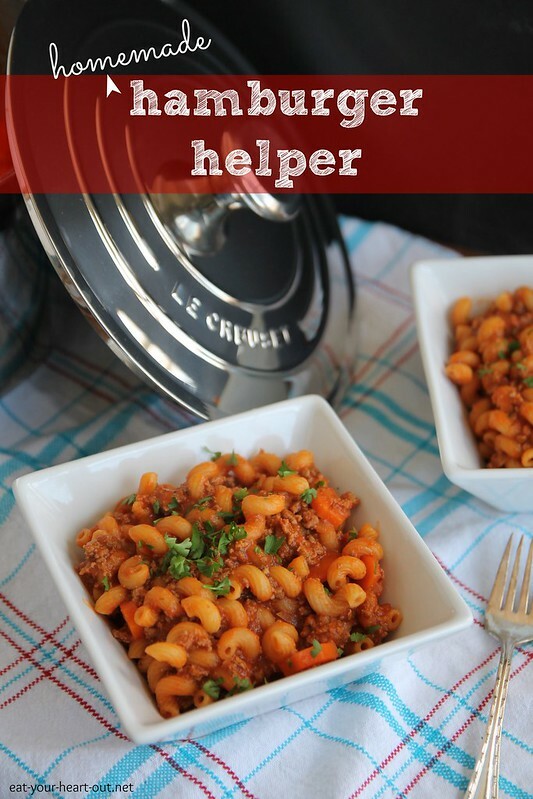 Homemade Hamburger Helper is my newest copycat recipe for Food Fanatic, but – as always – you can get the recipe right here. Stephie I’m so happy I found your blog! I love it!! This looks like the perfect dinner – I can see why your bf licked the pot clean! Going over to enter the contest now – I would love to win one of those gorgeous new pans! Wouldn’t you know that the only thing I’ve been ahead of my time on deals with food? I’ll take it. I didn’t realize that this is one of the boy’s favorite things, but why should that surprise me? Seriously, it’s almost weird. This looks really good, pinned it. Will try soon! Is it bad that I eat as much Hamburger Helper in one sitting as your athletic training boyfriend does? It would be even more with this homemade version. Heaven help anyone who tries to take some from me. Momma Swope is epic!!! Love this homemade version! Momma Swope is the best! =) I was raised on homemade versions of boxed meals too.. and sometimes boxed meals with a boatload of veggies thrown on in! Isn’t she the bomb.com? And I’ve been known to throw some veggies in a boxed meal myself! when p deploys I regress into that wayyy too much lol. that and 1000000 stuffed sweet potatoes!